Happy Easter everyone! I was hoping to get this review out on Monday but this bomber beat me... I probably shouldn't have had the beers before it. Anyway I'm going to smash this review out now. As an aside how cool is that snifter? That whole bomber is in that glass! As regular readers would be aware that I'm quite a big fan of Rogue's beers. I've had almost everything they've brought out here, from Beard Beer through to the Voodoo Donut beers. This lairy red bottle is I think the first stout I've had from Rogue, but I could be wrong (in fact I am - I've had the Shakespeare Oatmeal Stout), and I'm really hoping that there will be lots of chocolate in this one. The body of the beer pours a very dark brown colour with a voluminous cream coloured head. The head lasts for the entirety of drinking, which is impressive considering it took me at least an hour and a half to finish. There is plenty of lacing left behind, in fact I can't think of a stout that has better lacing than this one. All in all a very impressive looking beer. WOW! 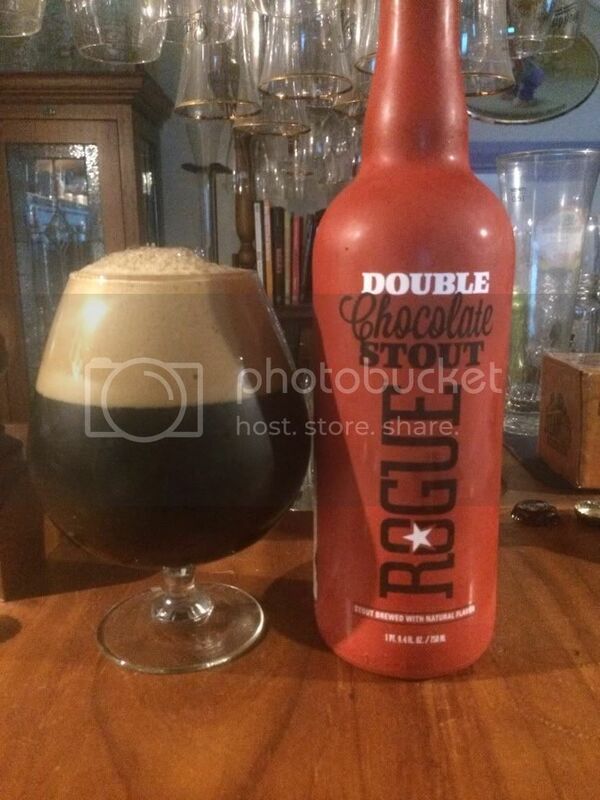 The aroma of Rogue's Double Chocolate Stout really lived up to expectations. It was huge on chocolate! As the beer warmed there were more elements, although similar, toffee and a hint of coffee being the most noticeable. Thankfully for a 9% stout, there was no hint of alcohol on the aroma which is always pleasing to me. Unsurprisingly the taste was also strong on chocolate flavour. Other than chocolate there was a small hint of roast, but that was about it. I think the most apt description of this beer I've ever heard is "It delivers on Double, on Chocolate and on Stout." That pretty much sums up my feelings towards the beer, it's everything I expected and nothing more - a solid if not exceptional beer. While not the most chocolately beer I had this Easter, that honour goes to Saltaire's Triple Chocoholic (amazing by the way! ), it's still pretty strong on chocolate. Personally I would recommend sharing this bomber with someone else if you get your hands on a bottle, it's very good but packed more of a punch than I had expected. Definitely worth trying if you are a fan of chocolate stouts.